Another year and more heartbreak for Matt O’Flaherty Chemist Titans. 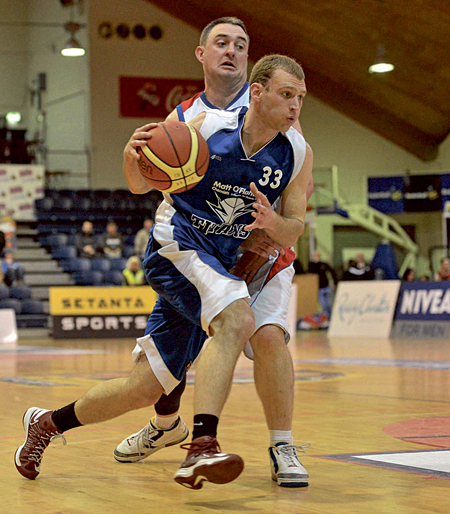 Galway’s National League title hopefuls suffered yet more disappointment when they lost to Blue Demons in the Basketball Ireland men’s division one final. The loss is Titans’ fifth straight league final defeat at this level. Demons’ scoring fire power was too much for Titans’ defence to handle on the day and it resulted in the title returning to Leeside after an absence of many years. In the last two meetings between these teams, the Titans came out on top, but this was not obvious at the start of this game as the Demons hit the lead early and maintained it for the entire first quarter. Christian Anon started the ball rolling with a quick basket from the tip off while at the other end the Titans were failing to convert their layups. Midway through the quarter, Titan’s forward Taofik Mustapha attempted to claw back the difference with a strong three-point play. At the end of the quarter though, the Demons were still four points up – 22 - 16. The Cork side started the second period as they ended the first, converting their shots under the basket before Titans hit back. Connall MacMichael scored a three-pointer and Andre Tonge was sent to the foul line. He hit one from two and put the Titans up by one, their first lead for the game. But in the last few minutes of the quarter the Demons pushed ahead again. Their long-range jumpshots were impressive and the led by 10 points at half yime. Two three-pointers from Brian O’Neill within the first three minutes of the third quarter pushed the lead to 16, although there was not much in it for the quarter, with Demons scoring 23 for the period and Titans 20. Paulius Peldzius contributed 11 of the Titan’s 20 points for the quarter, but they were still down by 13 at the end of the period. Midway though the final quarter the Titans were in foul trouble, and. although they pulled out all the stops with a full court press, they failed to hit their shots. In the end, five of the Demons scored double figures as they ran away with a lead of 25 points and the League final title. Blue Demons: 88 (40 ), (Christian Anon 22, Kyle Hosford 18, Tim O’Halloran 15, Thibaut Priou 15 ). Matt O'Flaherty Chemist Titans 63 (30 ), (Andre Tonge 22, Paulius Peldzius 17, Conall MacMichael 8 ).